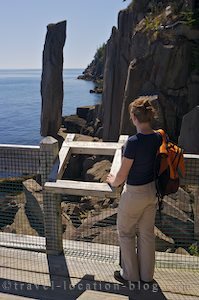 A whale watching tour into the Bay of Fundy to find Humpback Whales and White Sided Dolphins then a trek through the woods to St Mary's Bay and Balancing Rock. Rock, Long Island, Nova Scotia. The whale watching tour was to depart Tiverton on Long Island at 10:00am and since we were a ferry crossing away from the island, albeit extremely short, we rose early and headed for the lineup. Lucky we did too as there was a fuel truck heading to the islands which has its own ferry crossing - no other passengers or vehicles allowed on. so we had to sit one ferry crossing out and hoped we'd still be in time to check in for the whale watching tour. We made it in time, actually tons of time. We'd chosen to go out with Pirate's Cove Whale and Sea Bird Watching Tours which has 3 departures daily (at least during the high season) at 10am, 2pm, and 6pm at a cost of $45 per person. With a full load of passengers, the boat left the wharf in Tiverton and headed out into the massive Bay of Fundy in search of whales, dolphins, sea birds, and ....... aeroplanes? We rounded Boar's Head Lighthouse and hugged the Nova Scotia coastline for sometime before heading out into the middle of the bay to find the wildlife. Our first sight of a bird was the metal variety - a large military training aircraft circling above our heads. The plane finally left us in peace and we carried on out towards where we thought we saw some whales. Sure enough there were two humpback whales - a mother and calf duo resting on the surface or logging as it's also referred to. Since they weren't terribly animated we left them in peace to lounge about and headed off towards another whale watching boat which looked as though they were surrounded by sea creatures. En-route to the action, we passed by several bird species such as Greater Shearwaters and Storm Petrels. As we drew closer to the boat we saw that the animals were in fact Atlantic White Sided Dolphins which are similar to Pacific White Sided Dolphins on the BC Coast. These frisky dolphins got straight into the wake of the boat and also rode the bow wave, our fellow passengers were running from one side of the boat to the other and were delighted with the antics of the dolphins. All too soon it was time to head back to the wharf and leave the dolphins and whales to themselves. We were lucky to see another "logging" humpback whale as we were leaving and stayed with it for a few minutes before turning for home. On the way back, our guide who during the winter months works on the scallop boats, gathered the passengers around to show us the the shelling process of a scallop as well as its anatomy. Our model was of course a Digby scallop fresh from the Bay of Fundy! Once back at the wharf, we headed off to a cafe for lunch (we had a hankering for seafood chowder) and then to find the Balancing Rock. The trail lead us through the forest to a steep set of steps which scaled the sheer cliffs of St Mary's Bay. Turning a corner at the base of the steps, Balancing Rock came into full view - an intriguing sight of a narrow vertical rock standing on it's end on top of another rock - seemingly perfectly balanced. It's surprising that the rock could last in this position given its location right on the ocean. It was a long grunt back to the top of the stairs but it was worth the effort of going down. Once back at the truck, we continued on to the ferry at Grand Passage to visit the lighthouses on Briar Island. The ferry arrives in the town of Westport on Briar Island and once at the end of the towns tar seal road it turns to gravel and the landscape a remote paradise. The Western Light and Grand Passage Lighthouse are both on beautiful locations along the rugged coastline of Briar Island. We kept our visit here short because we'd decided to head back towards the town of Digby and then over to the Annapolis region that day. By the time we caught two ferries then reached the main highway, it was getting late but we made it to the Annapolis region in time for a beautiful sunset at Delaps Cove right on the Bay of Fundy. The only draw back during the whole day was the campground that night at Parker's Cove - for a "premium" site which is ocean view (but not right on the water) people were charged $95.00 a night - can you imagine - this is camping!! As it was, a regular site cost around $34.00 plus $1.00 for recycling (which they didn't even really recycle), and only two showers on the whole premises (one womens and one mens). So as you can imagine we only stayed one night - daylight robbery! !